This week has been very busy with co blogger Simon visiting from New York along with his son. We have been visiting some foodie hotspots and had a few meetings and lots of cooking too here in London. We even got to visit Windsor Castle, home of HRH Queen Elizabeth II, seeing the banqueting table used for state visits which seats 170 people. Definitely a big team required to ensure everyone gets served at the same time! We were also very lucky to see a few behind the scenes foodie areas including the glass pantry where all the glasses are washed and stored, clean & sparkling ready for the next banquet. Simon is an American citizen and bought a little foodie memento – an apron with ‘God Save The Queen’ and the Royal Coat of Arms proudly displayed – very patriotic! Simon is a big cheese fan and loves British Stilton from Colston Bassett and British Mature Cheddar which he ate with my homemade spiced apple & grape chutney ( see blog archives for my recipe). As I am also partial to cooking with cheese you can check out our archives for recipes with Collier’s Cheddar (@collierscheese) and others too. 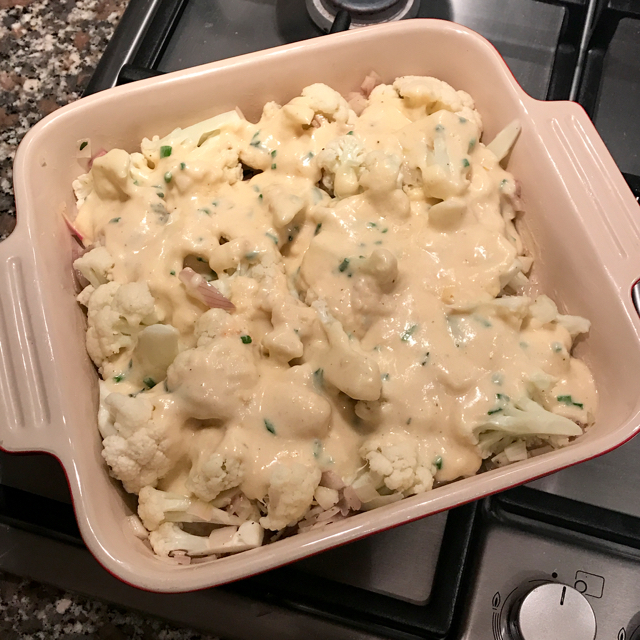 I decided to make a classic British vegetarian dish using Collier’s Welsh Mature Cheddar along with cauliflower which is in season. My recipe has a few twists for an extra tasty dish that is easy to make. 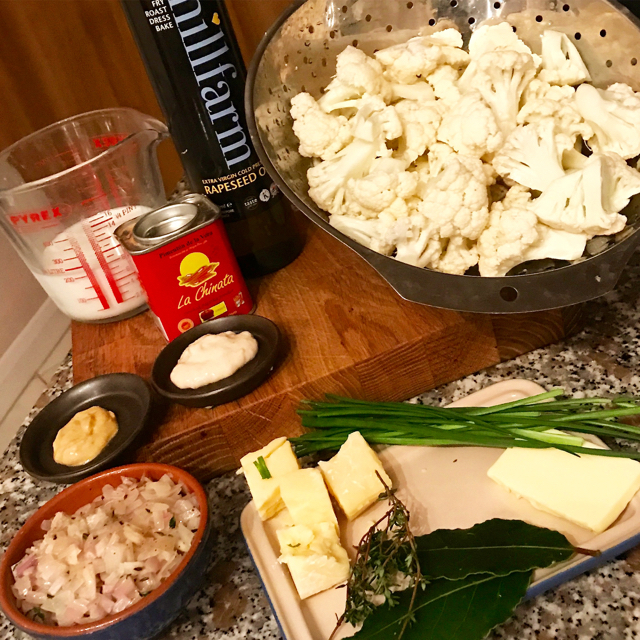 Cook the cauliflower and bay leaves either by steaming for 4-5 minutes in a colander over a pan of simmering water or cook in the microwave with a teaspoon of water. Saute the chopped shallots in a teaspoon of vegetable oil in a small pan on a medium low heat for 5-8 minutes until soft but with no colour. 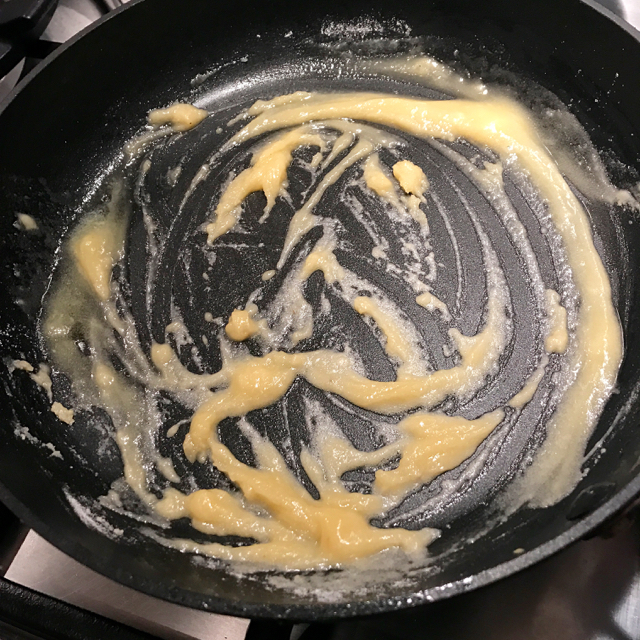 Melt the butter in a heavy based pan and add the flour mixing well (called a roux). 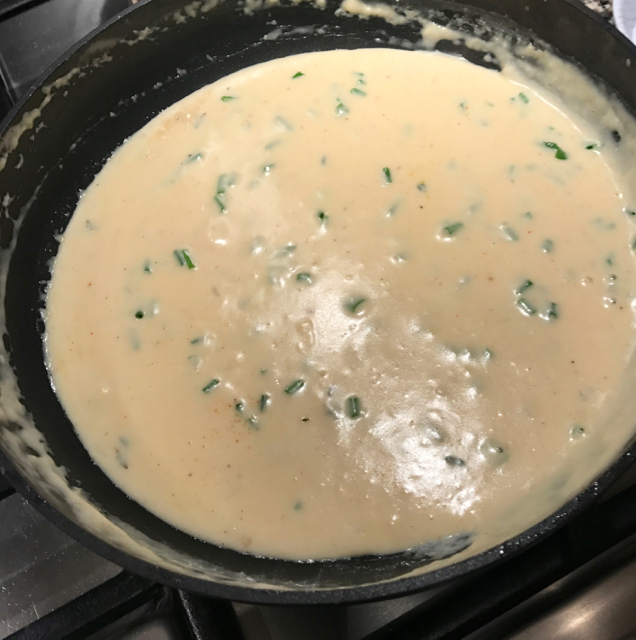 Cook the roux on a medium heat for 2 minutes stirring constantly to cook out the flour. Add the milk a dessertspoon at a time stirring well in between to ensure a smooth white sauce with no lumps. Add the mustard, horseradish and smoked paprika (if using), fresh thyme, some freshly grated nutmeg, salt & pepper and mix well. Add 2 tablespoons of the grated cheddar and a teaspoon of fresh chives, stir into the sauce until melted & incorporated. Put the cooked cauliflower (discarding the bayleaves) in a large heat proof dish. Add cooked shallots and the cheese sauce on top, and top with the remaining grated cheddar. Bake for about 20-25 minutes until the top is slightly brown & bubbling. Add some fresh chives on top & serve. 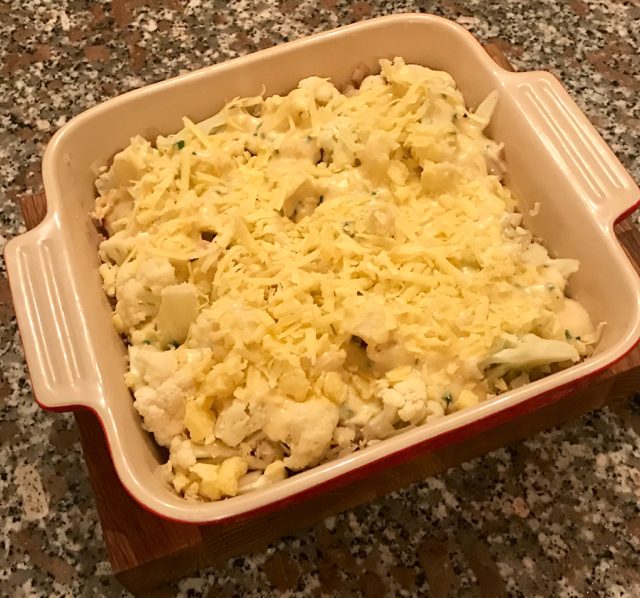 My cauliflower cheese please – a vegetarian, tasty dish easy to make and great for lunch or supper with a salad, your favourite veggies ( I like steamed broccoli or kale). Alternatively serve as a side dish with fish or meat.